I am lucky enough to read for a living. As a literary agent and a writer, I constantly seek out new stories to hone my own craft and to stay abreast of the trends in the market. Reading makes us better writers and editors, and is a key part of continuing education. Since I read so many books for both work and pleasure, I need to be hooked into the story quickly. A book can have the most beautiful prose, exquisite world-building, and shocking twists, but as a character-driven reader, I still need something more. I need to know why this story matters to our protagonist. In a word, I need to know what the stakes are. What is at risk—what the protagonist has to lose or to gain. Now, stakes can be huge, overreaching threats—the Kingdom will fall, the world will end—or small—I have to pass this class to get into college. Regardless of their weight to society, the stakes have to weigh heavily on the protagonist and be intimately tied into the character’s motivations. Every choice that they make throughout the story needs to be made with these goals in mind—it gives the characters a strong through line that helps create a thoroughly believable character arc. One of the main reasons I put down a book—or sample pages—is because I don’t get a clear sense of the stakes. If your queries and sample pages are not connecting with agents, step back and take a look at your story’s stakes and see if they are clear and accessible. There are two major issues that I see regarding stakes. The first is the story has a slow first act. Perhaps the writing is focusing too much on world-building, or getting too bogged down in exposition. Perhaps they are spending too much time setting up the world and the status quo, and the inciting incident doesn’t come until far too late in the story. The inciting incident is the moment when the stakes are revealed, when the plot truly beings to move, and we learn why these characters are being pulled into this story, and what they can gain or lose from it. When you are looking at your manuscript, try to pin down the moment that the story really begins, and if it comes in late, ask yourself if it can be moved earlier. The amount of time you have to play with varies by the age category and genre that you are writing in. An adult epic fantasy will have much more space in the first act for setup than a zippy YA contemporary. The best way to get a sense of what the standards are is to read widely in your genre. Take a look at what’s been selling well in the past couple of years, and study how those books do it. The second issue I run into is that the characters are too passive. I know this is common advice that you can find anywhere, but I find that when a character is too passive, it’s helpful to think about the stakes that they face. Over the course of the story, they should have a chance to gain something they want or lose something dear to them—or, ideally, both. If you are struggling to make your character active, stop and take a look at your stakes again. See if you can draw them forward and use them to redefine your character’s arc and path, making them the pilot of their own choices and desires. All this said, sometimes I run into the issue where the stakes are too remote. I see this a lot in speculative fiction, where the threat the characters face is at a national or global scale. Believe me, I understand the argument that they want to save the world because they’re the fools who live in it, but honestly, there needs to be a bit more. When you’re facing an end-of-the-world situation, you need to make it really clear why it’s this person—or this group of people—who are the heroes. What are the specific things that are driving them, personally, that hundreds of other people cannot do? 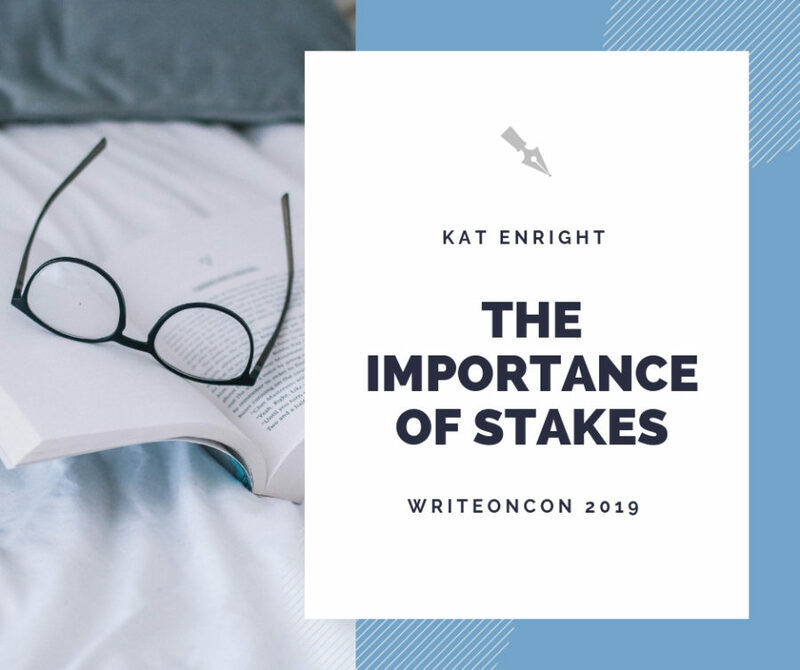 Stakes, in the end, are intensely personal, and the best stakes are connected to the individual characters’ wants and needs. They should be informed by the characters’ backstories, shaped by the lives they’ve led, and informing all the choices that they make. They are the consequences and motivations wrapped into one, and they’re one of the first things I always look for in a story. And if I can’t find them, then I am not going to connect with it. Kat Enright, (she/they), is an Associate Agent at the Seymour Agency who represents both fiction and non-fiction. Prior to joining the Seymour Agency, she worked in a variety of departments in publishing, including Sales and Editorial, and has a keen understanding of the many stages that a book must go through in order to reach bookshelves. As someone who lives on the corner of many intersections, she is most especially interested in elevating voices of marginalized authors. She can be found on twitter @KatEnright and at katenright.com.